It’s that time of the year again. Happy Holidays to everyone! I’ve truly enjoyed sharing my various poems with you each month. I hope and pray you have received some form of motivation or inspiration from my work. It is truly a passion of mine, and I’m so grateful to have friends and family like you in my life that allow me the opportunity each month to express my creative side. As the year winds down, many people reflect and start to think about goals, hopes and dreams for the upcoming year. “Will you stand? 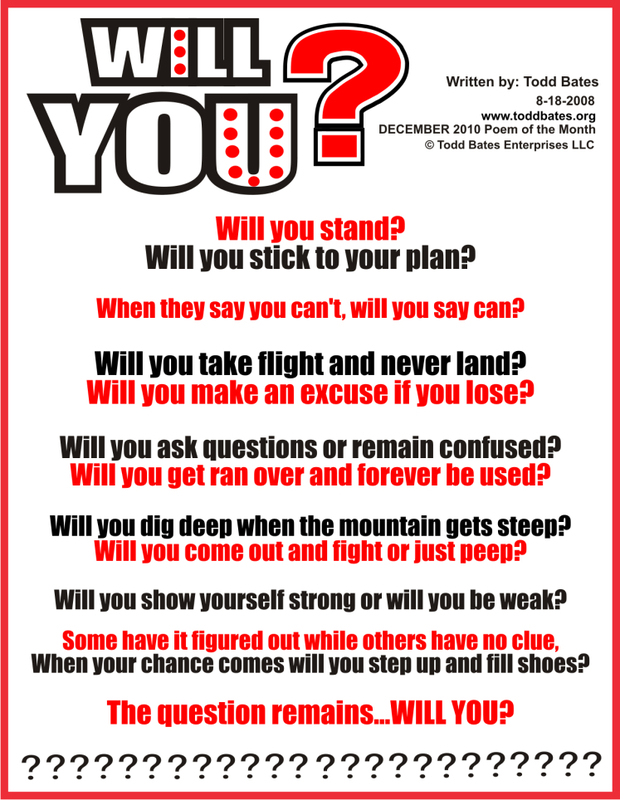 Will you stick to your plan?” Check out the December poem of the month, “Will You?” Don’t forget to leave a comment! I appreciate all of the responses I have received over the past year. The messages are very encouraging. Have a blessed month! Will you stick to your plan? When they say you can’t, will you say can? Will you take flight and never land? Will you make an excuse if you lose? Will you ask questions or remain confused? Will you get ran over and forever be used? Will you dig deep when the mountain gets steep? Will you come out and fight or just peep? Will you show yourself strong or will you be weak? When your chance comes will you step up and fill shoes? The question remains, Will you? Thank you for allowing my boys to see,what faith in God and what hard work can do in a person life.May God continue to bless you and your family.Happy holidays. That’s a great poem. I could have expected as much. I will miss you after February, as will almost all of the school. The only ones that don’t are the ones who don’t know you’re leaving. See ya at school! —-I’m not Will. I’m Corey. I enjoyed the poem as always. I wish you and your family a blessed Holiday season. Talk with you soon. I always enjoy your emails and poetry. It is such a joy to see the young man you have become. I admire you and the fact that no one has to guess where you stand in life. You have made great strides since CCHS!